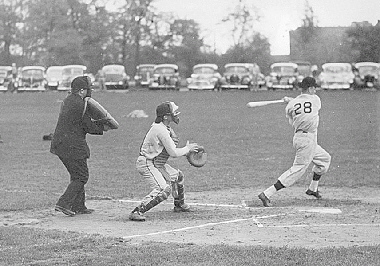 Blue Jay Don Chambers takes a swing in a game against Maryland in May 1947, eight years after Hopkins' first baseball diamond was christened on what later became Garland Field. This is the first of an occasional series of historical pieces by Ross Jones, vice president and secretary emeritus. A 1953 graduate of Johns Hopkins, Jones returned to the university in 1961 as assistant to President Milton S. Eisenhower and was a close aide to six of the university's 13 presidents. Anyone looking out a window on the south side of Garland Hall on the Homewood campus these days will see nothing but construction workers, heavy equipment and a huge hole in the ground. It might be difficult to believe that Garland Field, to be known when completed as the Alonzo G. and Virginia G. Decker Quadrangle, was the site of Hopkins' first baseball diamond. And that the field, opened in the spring of 1939, turned around the fortunes of an otherwise dreary, and losing, baseball team. The story of baseball's rehabilitation and the creation of a new field began on May 23, 1938, when P. Stewart Macaulay, then secretary of the university (later to become provost), recorded in a memorandum to President Isaiah Bowman that he had had lunch that day with "a Mr. Callahan of the firm Potts and Callahan, general contractors." Callahan's son played first base for the Jays, and Macaulay described the older Callahan as being "much distressed at the condition of the so-called baseball diamond." "You know," Macaulay wrote to Bowman, "that it is used only for practice and that because of its condition, all regular games are played on borrowed fields." Callahan had informed Macaulay that he "had a job coming up" that would provide 5,000 to 6,000 cubic feet of fill, which he would be glad to dump on the existing field and then grade it and turn it into a respectable field. The cost would be negligible. "Opening the season April 12, with only a polar bear missing to complete the Arctic atmosphere, the nine trotted around the bases 17 times in order to keep warm. It was the first baseball game in the history of Hopkins to be played on the Hopkins campus, and the squad downed Wilson State by a score of 17-1 while christening the new diamond." The editors added: "With a brand-new field and several veterans back in the fold, Coach Bob Owings ... has built up baseball to such a height that for the first time since its inauguration five years ago, the American pastime loomed as a threat to the dominance of lacrosse at Hopkins as a popular and most successful spring sport." There was an amusing postscript to the creation of the new field. The site had no name. But, for unexplained reasons, the manager of the bookstore, who in those days was responsible for the creation of a campus map, put the name Owings Field on the map, presumably to honor the coach. That map appeared in the 1940 summer school catalog. A Baltimore Sun sports writer, Craig Taylor, noticed that and used the name in one of his stories about the Hopkins team. Macaulay, a former Sun staff member, saw Taylor on a bus and told him he had better get his facts straight; the field had no name. Taylor referred Macaulay to the catalog and the map, which Macaulay had not seen. Macaulay wrote Taylor: "You've got me. I don't remember when I have had an argument bounce back with such force. My only consolation is that (a) it comes from an old colleague and (b) that colleague works on The Sun, where also the right hand never knows what the left hand is doing." Macaulay told Taylor that while he was taking steps to correct the map, he felt "so beaten down" by Taylor that he might "seriously consider a proposal to rechristen that part of the campus Taylor Field." The Blue Jays open their 2006 baseball season this week in a game against Messiah. For details, see Calendar, in this issue. GO TO FEBRUARY 27, 2006 TABLE OF CONTENTS.